He has a very logical, powerful approach to explaining the Scriptures. He was well-traveled. One of his writings takes place in Corinth, Greece, though he lived in Rome. Thus, his writings express wide Christian opinion, not just his own. The couple times that he presents views that are not universal, he points out that there are Christians who would disagree with him. He has an incredible knowledge of the Scriptures. His philosophical training moved him to commit long passages of Scripture to memory. His tone is forthright and down to earth. He covers many subjects, including describing the 2nd century baptism ceremony and their Sunday gathering (thus providing one of many strong testimonies that the early Christians were not Sabbath keepers). First Apology is a wonderful description of Christianity, and it contains the earliest description of a Christian Sunday meeting. It describes baptism, how it was performed and to whom, and it describes weekly communion at the Sunday meeting. Very interesting. And on the day called Sunday, all who live in cities or in the country gather together to one place, and the memoirs of the apostles or the writings of the prophets are read, as long as time permits. Then, when the reader has ceased, the president [probably meaning "the one who is presiding," rather than being an official title] verbally instructs, and exhorts to the imitation of these good things. Then we all rise together and pray, and, as we before said, when our prayer is ended, bread and wine and water are brought, and the president in like manner offers prayers and thanksgivings, according to his ability, and the people assent, saying, "Amen." And there is a distribution to each, and a participation of that over which thanks have been given, and to those who are absent a portion is sent by the deacons. And they who are well-to-do and willing give what each thinks fit. What is collected is deposited with the president, who helps the orphans, widows and those who, through sickness or any other cause, are in need, and those who are in bonds and the strangers sojourning among us—in a word takes care of all who are in need. But Sunday is the day on which we all hold our common assembly. because it is the first day on which God, having wrought a change in the darkness and matter, made the world. Jesus Christ our Saviour on the same day rose from the dead. For he was crucified on the day before that of Saturn [i.e., the day before Saturday]; and on the day after that of Saturn, which is the day of the Sun, having appeared to his apostles and disciples, he taught them these things [what's contained in the rest of his defense of the faith], which we have submitted to you also for your consideration (First Apology 67). Much of Justin Martyr's description of baptism is quoted on the water baptism quotes page. Justin Martyr's Dialogue with Trypho, a Jew is the best exposition of the OT Scriptures on Christ you're going to find. It's incredible! If you've ever wondered what Jesus told the disciples on the road to Emmaus, when "beginning at Moses and the prophets, he expounded to them all the Scriptures about himself," then this probably has much of your answer. Having mentioned the Sabbath, I need to point out that the early Christians had a unique view of the Law that we have forgotten. It's explanatory power is extraordinary. It eliminates all the difficult verses surrounding the Law and the Sabbath. "I am aware that your precepts in the so-called Gospel are so wonderful and so great, that I suspect no one can keep them; for I have carefully read them. But this is what we are most at a loss about: that you, professing to be pious, and supposing yourselves better than others, are not in any particular separated from them, and do not alter your mode of living from the nations, in that you observe no festivals or sabbaths, and do not have the rite of circumcision; and further, resting your hopes on a man that was crucified, you yet expect to obtain some good thing from God, while you do not obey His commandments." Henceforth, ye Greeks, come and partake of incomparable wisdom, and be instructed by the Divine Word. Acquaint yourselves with the King immortal, and do not recognize those men as heroes who slaughter whole nations. For our own Ruler, the Divine Word, who even now constantly aids us, does not desire strength of body and beauty of feature, nor yet the high spirit of earth's nobility, but a pure soul, fortified by holiness, and the watchwords of our King, holy actions, for through the Word power passes into the soul. O trumpet of peace to the soul that is at war! O weapon that puts to flight terrible passions! O instruction that quenches the innate fire of the soul! And from the earth transports them to the realms above Olympus. Come, be taught; become as I am, for I, too, was as ye are. These have conquered me-the divinity of the instruction, and the power of the Word. For as a skilled serpent-charmer lures the terrible reptile from his den and causes it to flee, so the Word drives the fearful passions of our sensual nature from the very recesses of the soul. First it drives out lust, through which every ill is begotten-hatreds, strife, envy, emulations, anger, and such like. Lust being once banished, the soul becomes calm and serene. Being set free from the ills in which it was sunk up to the neck, it returns to him who made it. For it is fit that it be restored to that state from which it departed, from which every soul was or is. It will be difficult to find a more poetic or powerful piece of poetry in the early church fathers. 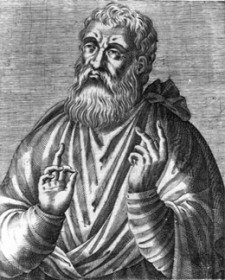 Justin Martyr's writings are among the most pleasant to read of the early Christian writings. You may also enjoy the story of Justin's martyrdom (written by an early Christian who witnessed it), or read other early Christian stories and facts. Please also consider signing up for our Early Church History Ezine, which has quotes and practical, challenging lessons from the early Christians delivered to your inbox each month. You can read Justin Martyr's writings, along with just about all other pre-Nicene (before A.D. 325) Christian writers, in The Ante-Nicene Fathers (10 Volume Set). If you go there, you may want to purchase the volumes separately, as the first 3 contain all the 2nd century writings. Justin's writings are in volume 1. Other collections of early Christian writings are offered at my online Christian bookstore (Amazon-powered).